Would you believe me, if I told you that yetis exist in Bhutan and tigers did fly to sacred places? Or maybe if I told you mermaids inhabited the lakes around Bhutan for many years? Well, I would understand your doubts too but legends claim they all did exist. A nation so mystifying, full of myths and legacies about great saints and fearless warriors, I am sure is enough to entice any wanderers to visit this mysterious land of the Thunder Dragon. Yes, Bhutan is also known as the land of the Thunder Dragon and even the national flag has a Dragon across it symbolizing the purity and fierceness of the country. This was so because of the ferocious storms that rolled in from the mighty Himalayas into the mountains of Bhutan which made it seem like a dragon roaring in the sky flying through dark and downy clouds. Anyhow this article is not about these mystical features about Bhutan but instead, it’s about the facts and specifics. 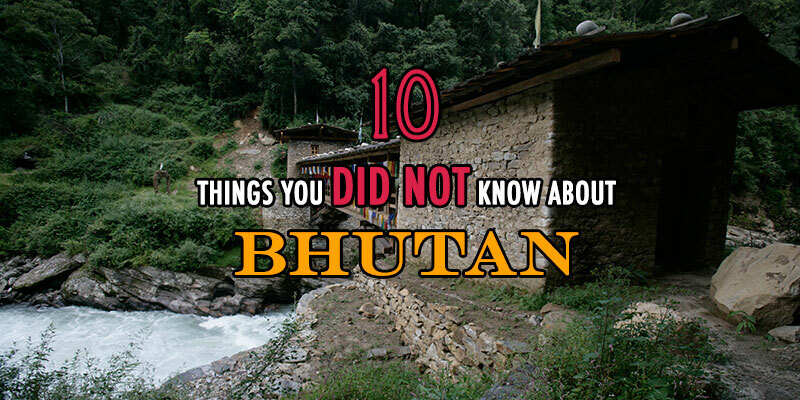 So here are 10 things that you probably didn’t know about Bhutan. 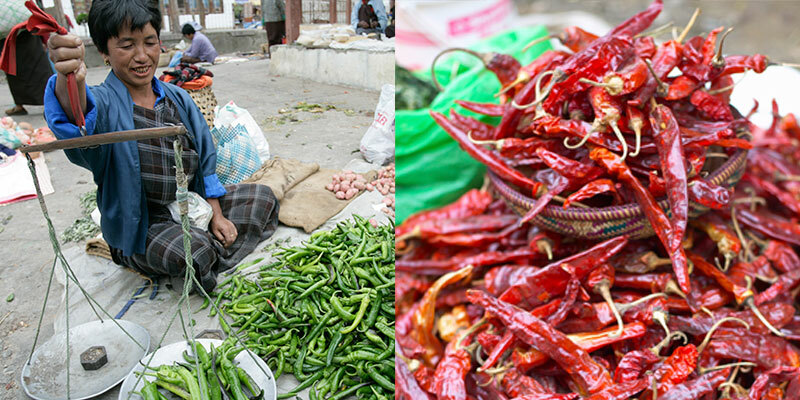 You might already know about Bhutan’s love for fiery chilies. That can be validated by the endless lines of stringed chilies that are hung from every Bhutanese house’s windows or from the fact that every house has a huge pile of chilies on the roofs kept for drying. So yes, Bhutanese eat a lot of chilies and not in the way other cultures do, as in people around the world treat chilies as a spice but Bhutanese consume chilies as a vegetable. Don’t be surprised, it is the most consumed “vegetable” compared to other food groups. This fact is quite humorous and very accurate too. Another amazing fact about Bhutan is that it does not have a single traffic light in the entire country and no, not even in the capital city of Thimphu. Instead of a robotic light that signals traffic, Bhutanese feel that a human traffic cop managing the traffic feels more personal and closer than a machine. Rightfully so, vehicular traffic is much simpler and pedestrian friendly in Bhutan. Now, this is an absolute delight for the non-smokers as Bhutan has banned the sale on tobacco since 2004. Not just that, the government even banned smoking in public places and for that Bhutan was recognized as the first country in the world to go completely smoke-free. For smokers though, they are allowed to import a certain number of cigarettes every month after declaring and paying taxes. If you are a smoker and planning on traveling to Bhutan, you might want to know how you can bring cigarettes to Bhutan. If you travel across Bhutan you will see a lot of phallic symbols either painted in different colors and shapes or a wooden carved phallus hanging by the roof. These are not there for aesthetic purposes but for a belief which states that it will ward off evil spirits and malicious intents away. Bhutanese do not take it as an offense but rather they will feel blessed by these images. Bhutan is the only country in the world to absorb more carbon dioxide than it produces. According to statistics Bhutan only produces about 1.5million tons of carbon dioxide a year and Bhutan has 72% of forest coverage. Thanks to that, Bhutan absorbs 6 million tons of carbon every year which makes the small Himalayan nation the world’s only carbon sink. The government’s effort to conserve its environment has always been a top priority. It has been also mandated that at least 60% of the country should have forest coverage at all times to come. Though Bhutanese people consume meat, the country has no slaughterhouse of its own. The meats are imported from its neighboring countries like India and Nepal. Due to its Buddhist beliefs, almost 40% of its population is vegetarian and killing is strongly prohibited in the country. Unless the animals die of natural causes, its owners are not allowed to kill them. Also, the sale of meat during holy months and auspicious days are banned. Don’t be surprised if you see cows wandering on the streets very happily. Though small in size and surrounded by giants like India to the south and China to the north, Bhutan was never colonized. Even during the time of British Empire, Bhutan remained a sovereign nation and it may be the only country in the world to never have been colonized. So Bhutan does not have an independence day instead the Bhutanese celebrate National day. On December 17, 1907, Bhutan crowned its first king unanimously which is now celebrated as the National Day. Did you know that visiting a temple in Bhutan can make you pregnant? This temple called the Chimi Lhakhang is a very unusual temple. Located in Punakha district, it is famously known as the Fertility Temple. Thousands of childless couples who made a pilgrimage to this temple in hopes of conceiving apparently did conceive after carrying out a certain blessing ritual. The ritual involves getting blessed by a 10-inch wooden phallus of the Divine Madman himself. The Divine Madman or Buddhist saint Drukpa Kuenley is credited for founding the temple. Till date, many women across the world who visited the temple and performed the ritual wishing to conceive, all claim to have conceived. Many first world country citizens assume that Bhutanese people may not speak English based on the fact that Bhutan is an Asian country. Also based on the fact that the tiny country is unheard of by many people around the world but most Bhutanese people and even children speak fluent English. In an age where even developed countries struggle to combat gender equality, Bhutan is pacing ahead of them as; in Bhutan, the women are the decision makers of the house. The fact that all the inheritance goes to the daughter and the son is required to move out into his wife’s house and make his own status in the society validates that women are given equal importance in a Bhutanese society. The list will go on since Bhutan is a mix of unusual yet fascinating experiences. To discover more baffling things about The Last Shangri-La, you should travel to Bhutan now. Celebrities who visited Bhutan & loved it! Great insight into the hermit landlock kingdom of Asia.